Good morning friends and Happy Friday. It has been a special week! It was my birthday on Tuesday and I think I’m almost done with a week long celebration. I used to dread it but now I’m definitely on the side of embracing it – I hope there are many, many more! I find that the thing I want most is not gifts but the ‘time’ of people, friends and family I care about. I’ve been lucky to get that, so blessed by wonderful conversation and listening that life definitely has me smiling. It’s a short post today but I’m sharing a card that will be given away to someone whose name is picked randomly from the comments left. If you are new to my blog – you can find info about Day of Giving on my FAQ List at #11. For your comment share something you received special that became your one of your favorite birthday gifts. Accessories: Nested Medallion Label Dies, Nested Oval Medallion Label Dies, Charm Dies, Martha Stewart Ribbon, Lace, Stick Pins, Recollection Pearls, Pearl Brad As always I’m working on several things. I’m as slow as molasses but I’ll be back with goodies to share soon!! Hello Becca happy to hear you had a lovely Birthday with the people you are close to and love ! HAPPY BIRTHDAY you are special . Hello Becca ,first a Happy Birthday to you. The card is gorgeous, love all the ellements on it. The colours ar just wonderful. A beautiful card from a beautiful lady. My engagement ring is the birthday present i most treasure. And in August we celebrated 40 years of marriage……….. I can’t think of any one gift that stands out from all others- everything is life is special to me!! Another beautiful card which I would love to have! I just returned from vacation and took the one which I received (plus the second one-inside joke) with me to show my sister and neice what a beautiful “BECCA” card looks like. It was still packaged in the box you sent it in and I put it carefully away in my RV dresser drawer so it would be safe! Several years ago, my son and DIL started planting a garden for my birthday. I always wanted a vegetable garden but couldn’t rototill the ground and plant everything. They now come up and do all that, even bringing tomato, pepper and squash plants. I started canning that first year and love having my own canned food. It’s healthier and tastes so much better than what you get in stores. Happy Belated Birthday Becca! Glad to hear you had a good one! My favorite gift on my birthday woukd have to be a camera lens when I was younger. I despaired of ever getting one because they were so expensive but my parents gave me one much to my surprise and delight. gift ever has to be 2 very small white glass vases, that my son spent the entire of his first ever wage on, when he started to deliver newspapers in the age of 9, and he felt sooo proud, that he had bought this all by himself for his own hard earned money. It´s 23 years ago now, but they still stand on my shelve here, and they stay there. A beautiful rescued greyhound. My daughter and her husband surprised me and “Tyler” became my (and my husband’s) special boy. He was gentle and loving. We no longer have him but cherish his time with us. I hope more people can experience the joy of a rescued dog. First off i hope you had a very Happy Birthday , your card is so beautiful as always. The best ever present i had was a cake the children made with Daddy it had icing on the top and was put into a box of sorts tied with a big red ribbon. i so loved that day all three children stood watching me eat it with big smiles on their faces , we had no money then but very happy memories that no one can take away, such happy days . This card is so lovely! The blue is so pretty, especially the ribbon and bow. I love how you layer die cuts to get the look you want. Glad you have had a great birthday! The older you get the more you realize how fast time really passes on earth. Happy Birthday wishes for a continuing celebration of YOU!!! I wasn’t going to leave a comment as I often don’t but I always pop in and read and am inspired by your cards. However there is one present which I will always remember because it came with a challenge! My Aunt Helen gave me a lovely antique silver teapot. She told me that an old lady had given it to her. The lady’s name was Miss Grey. She gave it to my Aunt as she had no family and my Aunt had been very kind to her over the years. However Auntie was asked to use that teapot in what Miss Grey called, God’s Service. Use it as you have used your own teapot in the past and when the time comes pass it on to someone else who you know will do the same! I therefore was given this teapot the year after I got married – more than 40yrs ago! I will do the same and pass it on and have someone in mind! It’s quite an unusual story but Miss Grey gave a valuable gift and a very thought provoking challenge! Happy Belated Birthday. My son had a birthday on Monday this week. I don’t know what would be my favorite birthday gift. there has been 75 of them so there is a lot of choose from. Love the card. Blue is my favorite color and this shade is so pretty. the big blue bow and the blue flowers are great. the die cuts are elegant. Happy Birthday! My favorite birthday gift, when I was 8, was my dog Snowball. She was a great friend for many years. Happy, happy birthweek to you! So pleased you enjoyed your Birthday! This is a beautiful card, made even more so by the beautiful Ribbon Bow you have made! Happy Belated Birthday and so good to hear you have enjoyed good times with those you love, so precious!! It’s been a while since I have visited your blog but now I’ve found you again. 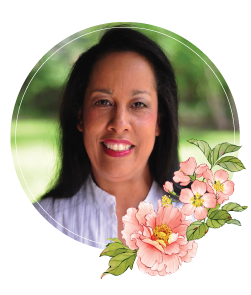 Your card today is a delight in Pastel blue and white….it’s truly beautiful. My favourite birthday gift has changed this year as I lost my darling husband a few months ago and until then after spending 47 wonderful years together just having him by my side was a gift in itself…and now today as I spend my first birthday without him my favourite gift is having my friends and family around me and reading all the beautiful handmade cards they have sent. Happy Birthday sweet Becca. I am right behind you with my birthday just around the corner. This is a great card. I love the stamped images on the text background. Stunning card, love the colour Blue you have used. My precious gift is always whatever my children have bought for me, it is always special to know they have got together and thought about it, my mobile and my watch I wear everyday were gifts from my children. I still have an old jumper my daughter surprised me with many years ago and I won’t throw it away lol! I hope you are well and a very belated HAPPY BIRTHDAY for last Tuesday. What a lovely card, Becca…and happy belated birthday! I love the coloring on the roses….and inside…my heart is going, “Please, pick meeeee? !” Just a beautiful card all around. One of my favorite birthday gifts is a necklace that my husband gave me before we were married. It is a tree silhouette with an inscription on the back..”the heart of every family is a circle of love.” I wear it often, and love it. Enjoy the time with special people this week, and I pray this next turn around the sun is a joyous one for you. This is a beautiful card, Becca. I love how you have arranged all of the die cuts. It never ceases to amaze me how you integrate all of the different shapes! What a lovely card! Any time you pair roses and lace, you’ve got my attention. “Happy, Happy Birthday, may all your dreams come true. Happy, Happy, Happy, Happy Birthday to you!”…you’ve just been serenaded. Maybe the time with your sister was part of your celebration? I have an identical twin sister. I live in CA and she lives in MD. Anytime we can get together is special and especially joyful are the ones for our birthday. We have celebrated every birthday that ends in 1, together. When we turned 41, my dad bought her a ticket to come home (to CA), so we could keep our tradition. One year, her daughter was married within a week of our birth date. Despite all the wedding preparations, my sister had a birthday party for us so I could meet all her friends…and they could see how alike we are/aren’t. Wow, that’s a birthday I will always remember. How true the adage, “The best things in life aren’t things”. This is a beautiful card. I adore it. My favourite birthday present was when my grandchildren made me a cardboard birthday cake (which I still have) and did a surprise birthday party for me. They were 6 and 8 at the time and made fairy cakes and small sandwiches (with the help of their mum). It was a such a lovely afternoon. Beautiful in blue card Becca…as always, you are such an inspiration!!! I think my i-Pad has been the most used and enjoyed gift! Thanks for the chance to win. Absolutely beautiful card, just love the delicateness of it! The blue color is perfect to set off the spiritual feel to the card. My most memorable birthday present was the surprise visit of my daughter and my 2 grandchildren who drove 10 hours just to spend my birthday with me! Beautiful, beautiful card Becca. You share your birthday with a grandson of mine, and nearly share it with me :-). One of my favourite birthday gifts was a signet ring from my parents when I was in my late teens. Loved that ring!! This years (today’s) gift is one the family have banded together to buy me and is an embroidery frame that is on a stand, so I can use both hands to stitch. Good morning Becca, Happy birthday to you!!! My granddaughter’s birthday was Tuesday : ) Life is so short you have to celebrate every single day. Everyday is a blessing!!! My favourite gift? The day I met my husband. Love your card it’s gorgeous!!! Belated Happy Birthday glad you had a good one. Its been so long since I received birthday gifts, I can’t recall one that stands out, when you get to my age. What a lovely card and the color, love how you used your dies. My birthday is the day after Christmas. My Mother always tried to make it special, seperate from Christmas. My best present was the year she celebrated it in June so that I could have a party and not be caught up in all the Christmas events. It was so thoughtful of her and so special to me! FIRST AND FOREMOST, my very good numerous wishes for your birthday – good health and joy in and of your life. This card is a little HUGE gem…………. absolutly gorgeous. A favorite birthday gift that was and is still special to me is a music box my dad gave me. My dad was not always known for giving me what I asked for when it came to my birthday. This music box was all the more special because I didn’t ask for it. A belated Birthday wish Becca.Glad to hear you had a great day with family and friends. A gorgeous card again Becca!love it. Hi Becca, Happy Belated Birthday to you, I’m so glad you have had a fantastic birthday week. 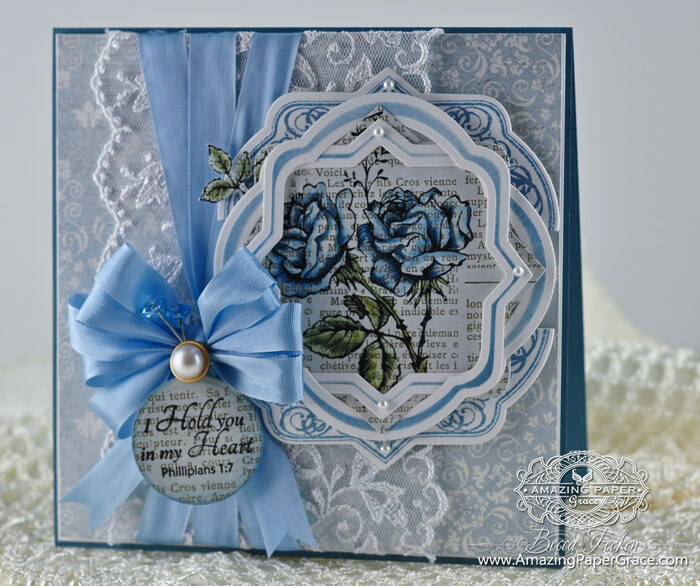 This card is stunning, the lace, the focal element on the script paper, the beautiful die-cuts and the stunning sentiment, all culminate in this beautiful ‘work of Art’. I love it, and the person who wins this will be so very lucky. I was given a stuffed white polar bear by my eldest Son in December 1986, I named him ‘Humphrey’, he sits on a footstool in my living room, he is very special to me as my Son died the following March, he was only 21, and he is ‘always in my heart’. Someone is going to love that card! So pretty! I have lots of ‘favourite’ birthday presents, but the one that stands out is the acrylic portrait of my mother our eldest painted for my 50th birthday. My mother had passed away and so this really was, and always will be, very, very special. Hi Becca, Happy belated Birthday glad you had a good one and this card is gorgeous. So sorry to be so late but I did post on your FB Wall :o) I have been so ill for the past week and half….. So Here Goes… Better Late than Never I always say! My hubby and his Family have always said that the Gift of Your “Presence” Is enough. My most favorite Birthday Present ever was the sweet card I got from my dear hubby as he always forgets my birthday or we are too broke to get gifts for each other. Before I got too ill to travel he used to take me to the Point Defiance Zoo for my Birthday every year and those are precious memories,too! One year he took me stands out in particular and that was the first year he took me after we got married…. We had the most beautiful Blue Peacock follow us everywhere we went in the park and at times he was serenading us (Actually it was his mating call) But it was so beautiful and haunting. The next year he took me to the Mary Hill Museum and we saw the most gorgeous all White Peacock she was a sight to behold! This is the most beautiful card!!!! !